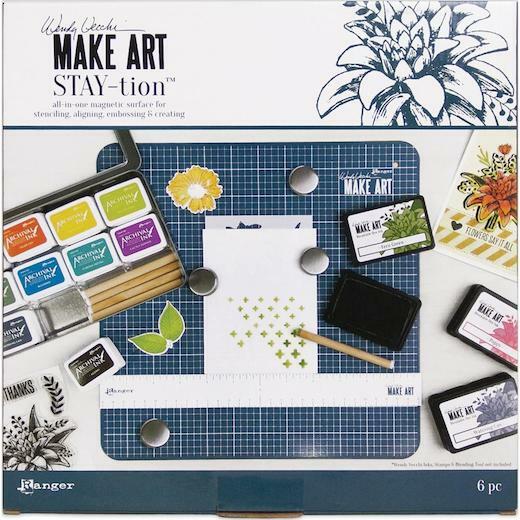 Wendy Vecchi MAKE ART Stay-tion is an all-in-one magnetic surface for stenciling, aligning, embossing and creating. The Wendy Vecchi MAKE ART Stay-tion™ is a necessity for every crafter! This 12” x 12” magnetic crafting surface features a printed grid and includes four brushed aluminum magnets and a flexible, magnetic centering ruler. No more slipping and sliding while stenciling. Use the magnets to securely hold surfaces and stencils in place while applying inks and mediums. Use the printed grid and ruler to align projects, or use the magnets to hold multiple layers in place.